There is a lot of European basketball action to take in these days but when it comes to the top level basketball event, you want to see the big names in action. This is a clash between two sides who have a strong pedigree and history when it comes to European basketball and if the game can stand up to the backstory, we could be in for some excitement and drama. The Italians aren’t at the level they would like to be with respect to European basketball but they have players who know how to get to the Euroleague Final. 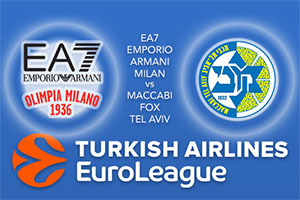 In fact, Milan has two players that played in Euroleague Finals with opponents Maccabi. Milan Macvan received the silver medal in 2011 with the Israeli squad while Ricky Hickman grabbed a gold medal in the 2014 final against Real Madrid. Both of these players will carry a lot of love in their heart for Maccabi Fox Tel Aviv but they’ll be desperate to defeat them on Thursday night. Milan will always hold special memories for Maccabi as this was the site of their most recent Euroleague triumph. Last season wasn’t a fantastic season for the Israelis but there is hope that there will be a return to form and the team has recruited well this close season. Signings like Sonny Weems and Quincy Miller have to be seen as positive captures for Maccabi but the problem for this game is that they are both injured. This means other players like Andrew Goudelock or Gal Mekel will need to stand up and make sure that their new team-mates aren’t missed too much. This could be a tight game and while the bookmakers believe the hosts will just about edge it, it is a game that looks up for grabs. Thinking along those lines makes Maccabi Fox Tel Aviv at +5, which is on offer at odds of 1.90, look to be a reasonable bet. If you are keen to engage the Over/Under market, you should look to go UNDER 160.5 which you can find on offer at odds of 1.90. Bet Now!